Ukrainian trains started to offer free Wi-Fi Internet on board. The train “Chernomorets”, which connects Odessa and Kiev on the route #106, has been equipped with antennas, routers, and other Internet communication equipment, KP.ua reported. Ukrainian passengers are happy with the newest addition. No longer they will have to struggle with mobile Internet while crossing the vast lands of Ukraine by a train. The mobile Internet works fine within the populated areas, but once the trains move to deep forests or plains, the connection may temporarily disappear. Now the trains will be connected to the satellite Internet, which will ensure better coverage for passengers. At the moment, the free Wi-Fi connection is offered as a test. After the initial trial period, the Odessa rail road officials will decide whether it’s worth to proceed with this initiative on other routes. It takes about 9 hours to reach Odessa from Kiev by train. Tickets cost from 215 to 400 Ukrainian hryvnia (about USD$10-18), and can be purchased online. 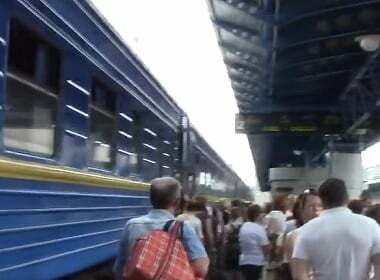 The next train that is due to receive a free Wi-Fi is “Chaika”, which connects Odessa and Kharkov. If you decide to buy tickets and travel buy a train in Ukraine in the future, you may be able to connect to Internet for free. Free Wi-Fi is widely available in Ukraine through city cafes and shopping centres. Kiev buses and trams, and even the famous Kiev funicular have the complimentary Internet connection available for clients. 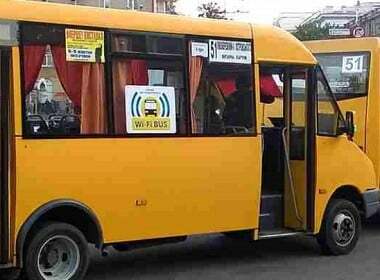 Selected buses in Kiev, Ukraine, offer free Wi-Fi. It was a natural development for Ukrainians to start offering a complimentary Internet access on long-distance trains. Are you talking to someone from Ukraine? Remember they have the facility to chat to you for free via Wi-Fi in cafes and other public places, even if they say that Internet access is too pricey for them. Russian cafes and centres also offer complimentary Wi-Fi for patrons. Don’t believe anyone who tries to tell you that Internet is not available, or too expensive. The online epidemic totally consumed Russia, Ukraine, and other countries of the former USSR. Children prefer to play with their gadgets, and it’s hard to make them get out of the house and play outside. If you are paying for communication with someone from Russia or Ukraine (paid chat/pay per letter), you need to read this information immediately. There are some dating services that use substitutes and “bait and switch” schemes to extract money for communication with fake personas, posing as pretty girls seeking love internationally. In his November 2015 video, Mike Koylo shows you his arrival to Kiev by a train, and views of the city during day and night. You are leaving the beautiful Ukrainian capital again by a train, riding through vast plains and crossing rivers. Yay! That is really an awesome initiative they launched. Travelling by train is often time-consuming and previously you had just slipped from communication during long-distance trips without the reliable internet connection. Finally, some some progress in solving the problem. I really hope they won’t shut the program down after a couple of trials. Yes, costs of local carriers will be much smaller than roaming with your usual carrier. Prices for mobile phone and Internet in Ukraine are very low, as compared to Europe. I love the idea, even though it’s not that special for the European countries, it surely is the great news for Ukrainians. Nowdays that the airplanes keep getting a more and more risky and unsecured way of travelling, the modern Wi-Fi trains appear to be a preferable and luxurious alternative. It is really helpful and useful to have free WiFi in the train: you can continue your work and conversations online and of course you can get-in-touch with people who have to meet you on the other side, so if you are a foreign person you won’t be afraid to get lost. Of course, free Wi-Fi in the modern world is a normal thing and it is great that people can use the Internet for their work and having fun during their travelling. Most people just can not live without the Internet and need it for many hours every day.